Creeping fig (Ficus pumila) is a good choice for a wall. It is an evergreen vine that will attach itself to wood, stucco or metal. No need to attach supporting wire or other framework, as the small disks on the backside of the tendrils will stick to the surface as it grows and covers. 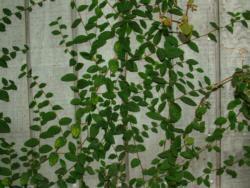 Creeping fig plants should be planted about 2 to 3 feet apart.